If you have a home compost, add in paper egg cartons. These cartons are made from paperboard, which works as a brown material to help the pile break down more quickly. There are hundreds of ways to repurpose egg cartons from making arts and crafts to starting a fire. As you grocery shop, think about where your food packaging will end up. Eggs often come in paper or foam casing. Did you know that paperboard packaging is the more eco-friendly option? It’s recyclable and biodegradable. Foam is less so because it’s made from polystyrene, or plastic #6, which is a petroleum product and often not recycled. Even if paperboard ends up in a landfill, it will break down and leave no harmful traces. One Hungarian graduate student designed an egg carton made from far less material. It is a design change that could have a huge environmental impact because it cuts down on every household’s waste. Her finished product is a single piece of cardboard that flips open and shut. 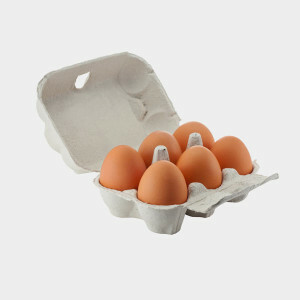 View this egg carton design.